That Dreaded Check Engine Light...What on earth can it mean. WARNING! A Check Engine Light can mean real trouble, or it can mean almost nothing at all. The problem is how do you, the driver, know the difference? I am about to tell you how you can tell the difference...stay with me. 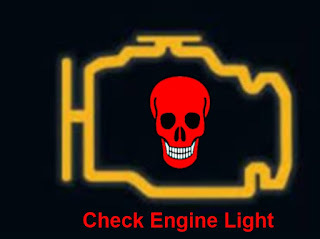 If your Check Engine Light is on, and it begins to flash, you can be in real expensive trouble. My recommendation is, if the Check engine light is flashing, DO NOT DRIVE THE CAR! It is much lighter on the pocketbook to call a tow truck than spend thousands on your car because you said to yourself, "I can make it into town". When a Check Engine Light comes on something is wrong. If you decide not to do anything about it, here is the top five reasons you should rethink your position. First, let's say the reason the light come on was because of a defective oxygen sensor. l. If you don't replace that sensor your fuel mileage can drop as much as 40%. 3. Your car will run at a higher temperature. 4. You may experience reduced performance. 5. Your car will not pass a state emissions test. This is an example of only one reason a check engine light may come on, other sensor failureS can cause similar results. KOOL KAR AUTO REPAIR IS YOUR ONE STOP SOURCE FOR ALL THINGS AUTOMOTIVE. CALL OR COME BY TODAY WITH ALL YOU AUTOMOTIVE REPAIR NEEDS.